It was announced today that the long anticipated biography of Ambassador Lee E. Wanta has been released and is now available to the public on Amazon. This is the only authorized biography of the Personal Intelligence Coordinator and Secret Agent who was mandated under President Ronald Wilson Reagan. The 350 page biography is backed up with hundreds of accessible documents to provide evidence and verification for the story of Lee Wanta’s life. The content released in this biography is sensitive, controversial and timely. Much of it has never before been shared with the American public. The subject matter it addresses has its historical foundation in Lee Wanta’s secret work under President Reagan to bring down the Soviet Union, financially ending the Cold War without firing a single shot. It explains how he privately amassed trillions of dollars and what he is going to do with these funds going forward. It provides in-depth information about how the Non-Government Federal Reserve and the Corporation State of Wisconsin hijacked his funds, as well as the criminal and corrupt way that they operate through a system of Puppet Masters. The biography contains new never-released Intel information regarding Vince Foster and Hillary Clinton receiving 250 million dollars from Lee Wanta for the Children’s Defense fund which has never been accounted for. The same day these funds were transferred he was put in prison and shortly after Vince Foster died. This biography asks hard questions that need to be addressed by many well know politicians. It explains how the Corporate State of Wisconsin operates well outside the Constitution and how they continue to operate this way under the administration of Governor Scott Walker. It exposes current activities in the Ukraine and corrupt destabilization efforts happening throughout the nation and world, and most importantly, who is behind it all. Learn how Congress has censored and suppressed information that should have been disclosed under Title 18 Section 4 and Section 201 and how some elected officials are using bribery and extortion to get to Lee’s funds. Because of the sensitive nature of the content and some of the new information regarding Presidential candidates from both parties, it could have possible implications on the upcoming election. 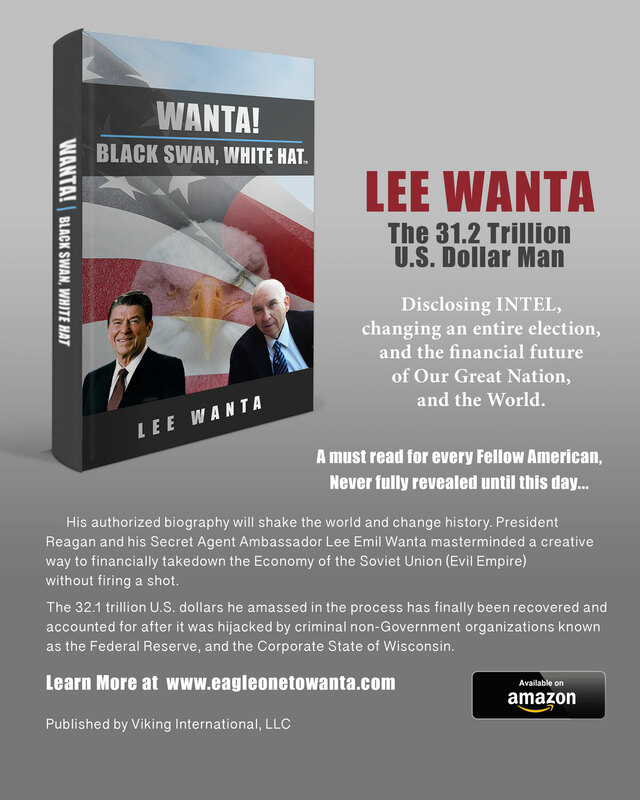 The biography helps dispel any doubts as to who Lee Wanta really is, about the $31.2 trillion he controls now, and what his goals are to help the country to rid itself of political corruption and get us back to a strong financial footing again as a world leader. The author of the biography is Lee Wanta himself, and has been edited by Lon Gibby, and published by Viking International LLC. A documentary film entitled Eagle One to Wanta is in production by Gibby Media Group, Inc. To follow this release of the biography the documentary will be released in 2016 www.eagleonetowanta.com. Ambassador Lee E. Wanta’s timely biography helps to clear up some of this confusion and restores hope that we can get our nation back in line with our Constitution: We the People and by the People.